What a poetic name! Very fine wines make pheasants shed tears of joy when they sip it….. Well, I must have been a pheasant in my past life, because I cry, too. When I sip a good wine, all the words for describing wines stop dead in my head and all I manage to utter is simply wows with my eyes automatically closing and my head moving sideways in a very slow motion. There should be non-verbal evaluation of wines like this. Words can disguise emotions but the body language can’t as passion is felt rather than spelt out. Don’t you think so? Have you had this kind of moment? You just want to savour it, feeling reluctant to say a word, as if any words would spoil the taste. Sorry, let me get back on the track. Though it wasn’t entirely irrelevant to the review I’m about to write because my experience with Pheasant’s Tears was about the attitude and respect for the nature. The winery wasn’t difficult to find after getting off the mini bus. 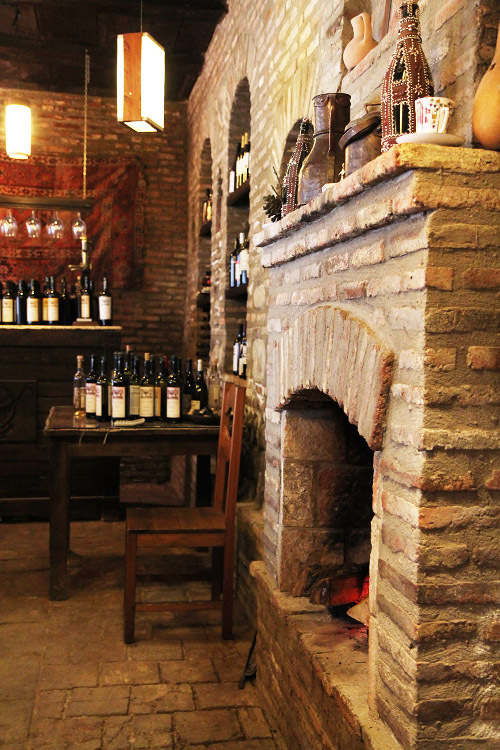 I instantly loved the settings of the tasting room; ancient brick walls, wooden furniture, adorned with antique artifacts every corner. The tasting manager, Shergil, who welcomed us warmly put on traditional Georgian music played by his own band, creating the atmosphere as if we were commencing a Georgian Supra(feast), which we regretted for not having had one! He talked us through the history of the winery and its winemaking method, with Georgian history and culture thrown in between. He was very well-spoken, attentive and sharing, and we felt lucky enough to be there in a quiet period and have all his attention. I won’t go into the details of their winery and vinification as it’s been written about on many web pages including their own (Pheasant’s Tears). Other blogs that have mentioned Pheasant’s Tears are listed below. We tasted 7 wines, whites, reds and chacha (Georgian grappa). Prior to tasting, we briefly visited the cellar and saw the much-talked of egg-shaped clay vessels, qvevris, buried underground, which are for private use, therefore a lot smaller than the ones used for the main production. At the first sight, the very first question that sprang to my mind was ‘How do you clean them?’ Apparently, after each production, the qvevris are cleaned by scrubbing with antiseptic cherry bark, flushing, burning with limestone and finally lining with beewax, which is the most crucial step. Everything is done without the use of any chemicals and there’s no fining or filtration of the wines. Another unique fact about Georgian winemaking is that the grapes are crushed and poured into the qvevri for fermentation with skins, seeds and stems and what not, at which I winced, since the adding tannins to the juice contrasted my knowledge of natural winemaking where grapes are gently pressed by gravity not to crush the seeds! But Georgians call the process ‘leaving it with the mother‘. The more I listened to the explanation, the better I understood the logic. So no yeast is added in the fermentation process as natural yeast is already on the grape skins. As long as the grapes are healthy, everything will be taken care of by the mother nature. I like the logic, which is a very different approach to a modern winemaking where all kinds of technologies are deployed to copy and ensure the desired final result, which I call ‘laboratory wine’. So far so good. The first wine we tasted was Tsolikauri 2012, cloudy white wine, which had aromas of apple, elderflower and almonds but not so complex. It could be due to the fact that the bottle was opened the day before. I had a reminiscence of Jura wine, though each method is totally different, therefore can’t be compared. I was impressed because it was my first Georgian white wine fermented in the qvevry I’d every tasted. It seems to lack the acidity I like but I had a surprise of tingling and slightly gritty sensation on the finish, which I thought was from the tannins. Apparently, this wine had no contact with skins or stems, then where do the tannins come from? How interesting, yes? My memory faded with the lapse of time so I had to email Pheasant’s Tears to clear the confusion. My email was passed on to the grower and winemaker, John Wurdeman, who personally replied to me, which I appreciated very much. He made it clear that this wine shouldn’t have tannins of any significant amount. If anyone who’s reading this has tried their Tsolikauri, please excuse my lack of knowledge and I’d appreciate your inputs on the tasting notes. Rkatsiteli 2011, amber wine, was cleaner and very very floral on the nose. Just look at the bright gold colour! This wine was crispier and more complex with supple citrus and stoney fruit flavours, finishing with grippy tannins. This kind of yellow or orange wine has slightly oxidative flavours, therefore is an acquired taste as is the Jura wine made with a traditional method, which has intense pear and nutty flavours. It’s just my personal taste that I like oxidative sherry-like oaky and nutty flavours as in Vin Jaune, especially Chatau-Chalon! But the Georgian white wines with tannins were another discovery for me. 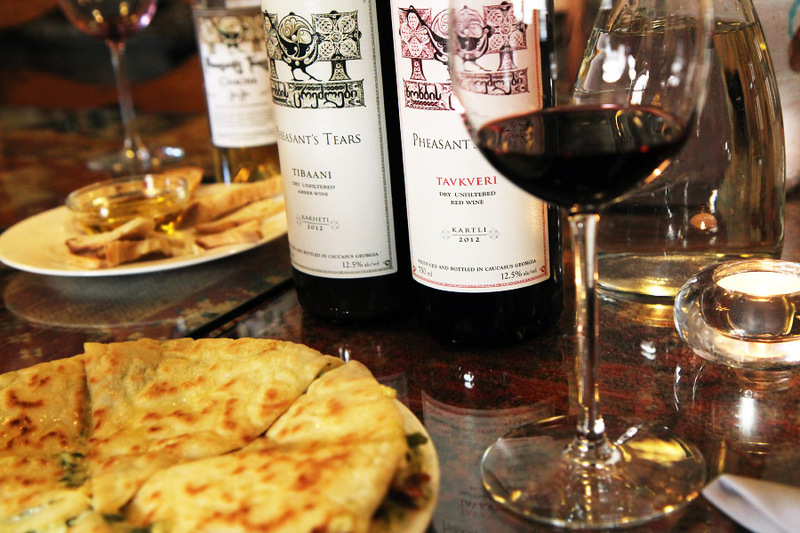 It’s pointless to compare Georgian wines with another country’s to say which is better because the grape varieties and methods are totally different. Then came Tibaani 2012, also amber wine, making my eyes even wider in confusion as for what to make of the colour. The wine is made from a mix of white and red grapes. So is it white, red or rose? The logic behind this unique wine is, simply put, to have a ta-da surprise; you collect over 400 varieties in the same block in the vineyard, mix them all and see what the nature brings to you. It was a sort of one-off experiment, which was their first trial, therefore special. It seemed like a perfect alternative for red wine drinkers who prefer reds to whites with seafood or light meat dishes. Though there was some crispy bread and olive oil, we felt like to change a bit of the taste before continuing with the reds. So we ordered a special cheese dish with spinach and had a sip of Tavkveri 2012. Bang on! Yes, this is what I came here for. The smell of seashells….as I mentioned it in the previous post. The seashell aroma was not as intense as the wine by Chelti Estate but it was there. Now that I had a conviction, I asked what the mineralic aroma is about. I get this seashell smell in many French wines as well. He doubted that it would have anything to do with the clay vessels but said the vineyard area was once under the sea level like the Sauternes area as I once wrote about here. The colour and the aroma almost made me think that it was French wine. Then he explained that Jancis Robinson also commented on its similarity to French wines and this was her favourite among their reds. It was fruity, herbal and floral with refrained tannins and the most elegant red I’d tasted so far. I was told that Tavkveri is normally made into Rosé but this one was closer to red than rose wine. The clock ticked away while we were immersing ourselves in the conversation and tasting and we decided that the cheese bread wouldn’t do for the reds we’d drink. So we asked for something substantial to go with the wines and he mentioned the famous white-wine braised pork by the chef, Gia. I couldn’t resist the sound of it. While waiting for the food, we started on Saperavi 2012, which I was well familiar with by then. I think the difference in the hues in the glasses above and below is pretty obvious. 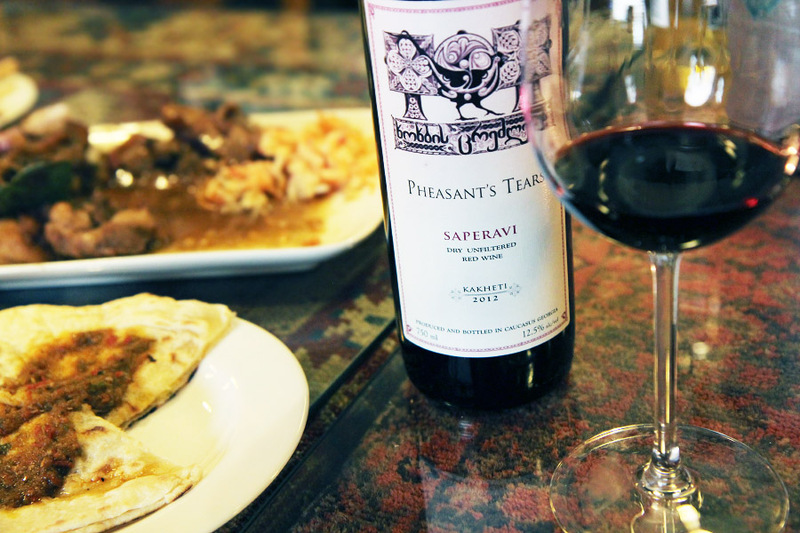 Saperavi has plentiful of dark fruit and black pepper flavours and it tends to leave thick stains on the glass. This wine was too young to be appreciated, leaving a little sweetness in the mouth, a bit too much for my liking. Also, I was a bit spoiled by the previous Tavkveri, I suppose. We thanked the staff for their excellent hospitality and left with our purchase, which includes Shavkapito 2012, which is said to be yet another indigenous grape variety. I’ll tell you how it is when I taste it. On the way back, the hill and the valley created a lovely ambiance under the setting sun and I tried to take photos but the mini bus driver drove so fast that I couldn’t. When we arrived back in Tbilisi, we bought some more wines at Vinotheca and headed to the train station to catch the overnight train back to Batumi. Since we had some time to kill and Mr.O wanted to try Georgian kebab to compare with the Turkish, we dropped in a hole-in-the-wall restaurant near the station. The owner didn’t speak any English but the kebab was understood. Just for the fun of it, I pointed to a random item on the menu and waited nervously for my order. But tada~ it was Ostri, the beef stew again! Oh, well, at least it was something I liked so I didn’t mind eating it twice, and in fact, this one was much nicer and authentic home style than the first one. Ok, let’s make a full package. So I ordered a glass of home-made wine and the lady was finally smiling and happy that we got more than just kebab in the end. Oh my god, the pork kebab was a real treat, really good. I’m still drooling remembering the taste. Even Mr.O was saying why the Turks are not making kebabs like the Georgians, thick and meaty, and cheap without the unnecessary extra stuff on the side such as bulgur rice, bread, etc. And the spicy tomato sauce for the kebab was super delicious. I’ll miss Georgian kebab very much. The street dog there were very different to Turkish street dogs, making us laugh every time we saw them. They were so busy running around looking for food where as in Turkey, you only see dogs sitting or sleeping because food comes to them. 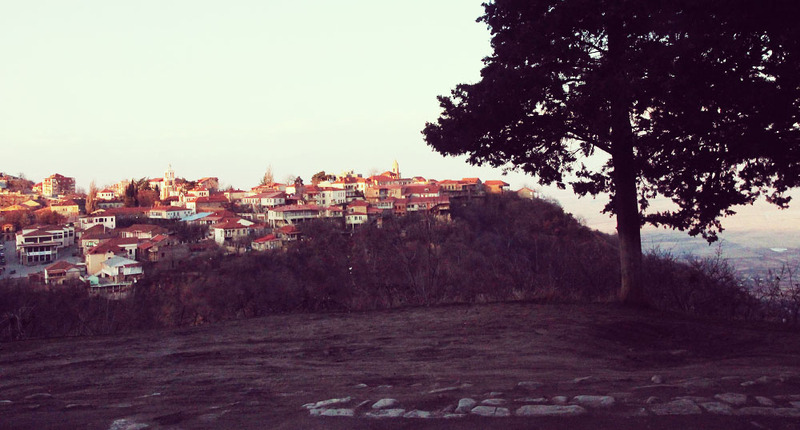 The final episode happened when we arrived back in Batumi. I couldn’t find any cafes, let alone ones with WiFi. I was getting frustrated as I needed to be online for work. When I finally found one, I realised I’d forgotten the power cord. Anyway, we found a French patisserie and managed to get my laptop working, treating ourselves with my favourite Opera Cake and Danish pastry, which I hadn’t had for a long time. Hopefully, I’ll have another chance to visit Georgia and eat the delicious food again. 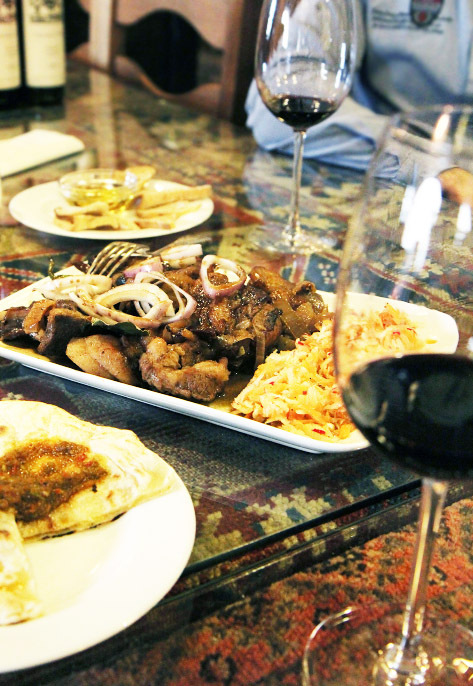 The Georgian cuisine and culture happened to become a very interesting part of the trip as much as the wine was. 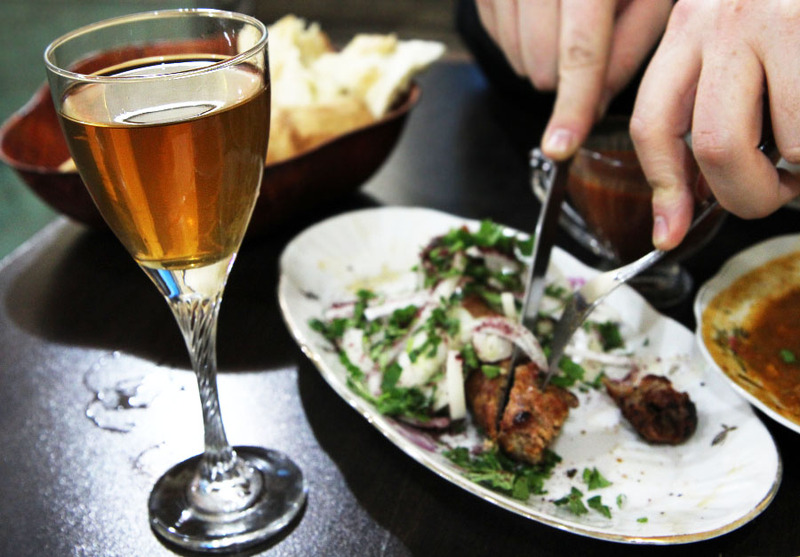 Observing how wine is deeply connected to their culture and identity proved my belief that the countries where wine is cherished can’t have bad food. I had to finish off this post in a rushed manner as it’s very hard to find time these days and I apologise for the lack of information in this post and promise to make up for it in the posts to come.